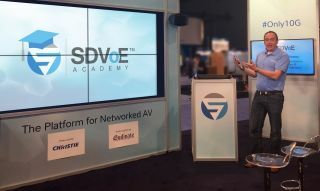 The SDVoE Alliance has launched the SDVoE Academy learning platform, offering free self-paced online courses for AV professionals to help them develop the skills they need to take advantage of the latest technologies for AV signal management. Although the focus is on SDVoE technology, the only interoperable AV-over-IP standard capable of replacing the performance of a matrix switch, the lessons are broadly applicable to the world of AV-over-IP, supporting AV network deployments in demanding education, healthcare, enterprise, entertainment, hospitality, retail, house of worship, government, military, industrial, and security environments. Created in cooperation with AV/IT training experts Clavia Ltd., the SDVoE Academy is designed to become a trusted resource to fill knowledge gaps as the industry transitions to the simplified AV architectures made possible by the SDVoE standard. The SDVoE Academy is available at https://academy.sdvoe.org/. All AV distribution and processing applications that demand zero-latency, uncompromised video can benefit from SDVoE technology, which provides an end-to-end hardware and software platform for AV extension, switching, processing, and control through advanced chipset technology, common control APIs, and interoperability. SDVoE network architectures are based on off-the-shelf ethernet switches thus offering cost savings and greater system flexibility and scalability over traditional approaches such as point-to-point extension and circuit-based AV matrix switching.